1. Combine all dough ingredients in a bowl, using hands to mix into a sticky dough. 2. (Meanwhile, chop and boil the potato, if necessary). 3. Put dough on well-floured surface; divide in half. Knead each side a few times on the flour until less sticky but still tacky. Cover and let rest for 10 minutes. 4. For the filling, caramelize the onion with butter or olive oil. Add in the potatoes and mash together. Add the cheese and mix together. Add salt/pepper, garlic, or other spices to taste. 5. 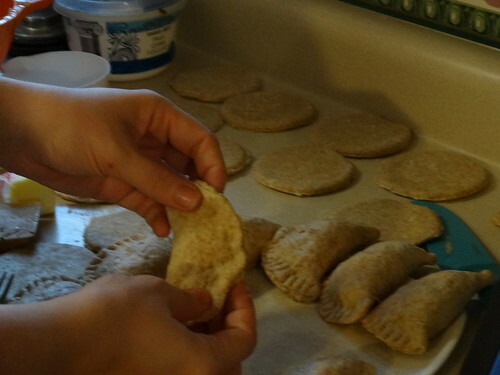 On a floured surface, roll each dough out in a thin circle, less than 1/4-inch thick. Cut out circles with a cup or circle cutter just under 3in wide. 7. 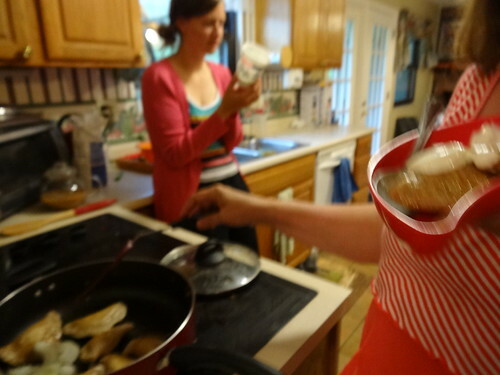 In a pot of boiling, salted water, cook the pierogi for 8 minutes, or until they float. Remove from the water and drain. (After boiling, you can spread out half on a tray in the freezer to saute for a later meal). 8. In a saute pan, melt some butter (can add onions for flavour). 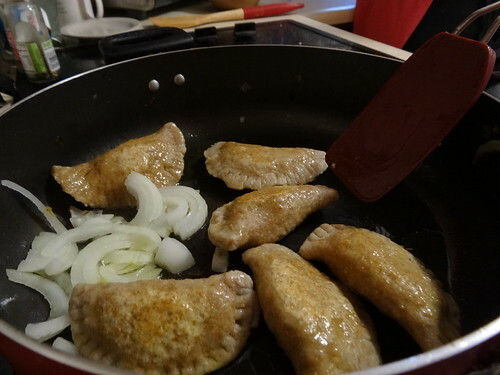 Sear the pierogis for 2-3 minutes a side, or until golden brown. Remove and start the next batch. Serve with fried onions and sour cream. In general, we found this was a filling recipe. We got 30 pierogi and were full with 2-3 each for 5 people. My family thought this was good, but weren’t as thrilled with this as they were with the kroppkakor. I suspect they didn’t appreciate the dry, healthy feel of the recipe I borrowed from. It’s true that a dumpling’s flavor usually comes from its meats, fats, and oils; not from greek yogurt and whole grains. PP’s wheat flour overwhelmed the taste of the filling; next time I’d just use white flour, like I’ve put above. Interestingly, PP labels her recipe as a sort of Polish-meets-Irish corned beef and cabbage, but there’s no cabbage listed! PP also used 5 potatoes, no apples, 1 c cheese; I used 2 potatoes, 2 apples, 1 c cheese. I’d add more cheese and apples, as above, leaving only one potato to smooth out the texture. I’d also roll the dough thinner and add more garlic or herbs inside. And since we still have half the recipe frozen for a quick reheat, we have plenty of time to experiment on more flavorful sauces for the outside!